Nutritious, tasty, easily grown, and safe for long-term storage, potatoes are a staple food for a reason. 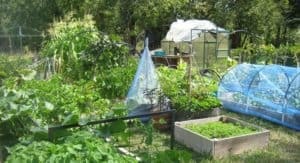 And if the SHTF, you can’t have a much better crop to rely on to get your through lean times and allow you to flourish in your environment. Growing potatoes is a super simple process, but like most vegetables some practice and experience go a long way. Dig them into the ground, or throw them into containers; even a burlap sack can be a suitable container to grow potatoes in. Potatoes can be harvested during the growing season but it’s wisest to save a main crop for its full maturity. You can often find edible and decently-sized potatoes about sixty to seventy days after planting, but a full main crop typically takes closer to one-hundred days to reach maturity. Each potato variety is different, so check those tags and read reviews before you commit to any one type. The duration of storage is an important factor too. Thinner skinned potatoes tend to store poorly compared to thicker skinned varieties. In order of longest shelf-life to shortest shelf-life, you’ll find russets, yellow or white, and then red potatoes. Plant lots of potato plants to save yourself some harvesting stress. Not only will you have a larger harvest, you’ll also be able to selectively harvest eating potatoes while growing a larger crop for your final harvest. Harvesting your potatoes ends with yanking them out of the ground, but the whole process begins weeks before you break into the soil. When your potato plants begin to produce flowers, mark the calendar; about two weeks after the plants produce blossoms you can start harvesting them. Expect to collect your first harvest about fifty days after planting, but don’t harvest everything! When you notice those flowers begin to develop you should begin to limit the water you provide the potatoes. Too much water will cause the potatoes to soak up too much moisture and begin to develop unsightly lenticels, not necessarily a bad thing but an indicator of too-moist soil. If your potatoes are of a variety that do not produce flowers, you can scrape away some soil from the base of the plants to look for the potatoes actually forming and then gauge how close your crop is to harvest. You can generally safely follow the days to harvest of your particular cultivar in the absence of flowers. If you harvest eating potatoes to enjoy throughout the season, I recommend harvesting individual, entire plants rather trying to pick out individual spuds from one plant (don’t worry, we’ll get to proper harvesting technique below). Potatoes are very easily damaged, and a single errant bruise or nick can spoil the rest of the bunch. 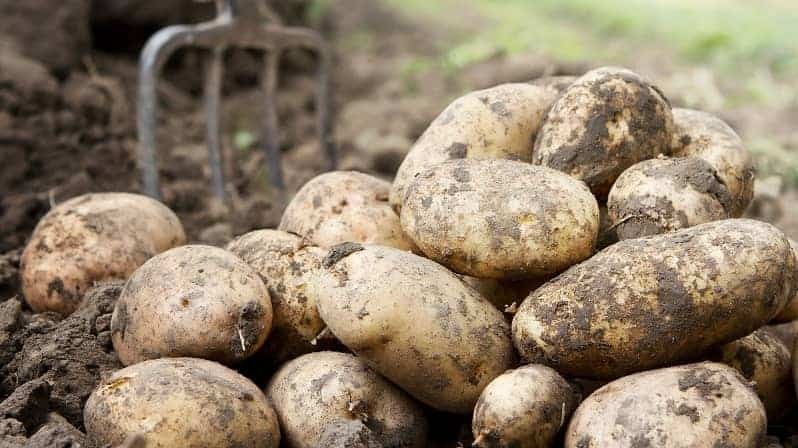 The spuds you harvest during the growing season are usually smaller and more tender, but the real goal of growing potatoes should be your end-of-season main crop harvest. It is essential to wait until your main crop is finished in the season before you try to harvest them. You could get away with pulling them out early, but your patience will be rewarded if you wait. Potatoes are usually harvested a few weeks after the first frost to ensure they’re at their best and biggest. The goal is to wait until the green vegetation above ground dies, then you wait about two weeks to harvest the potatoes. 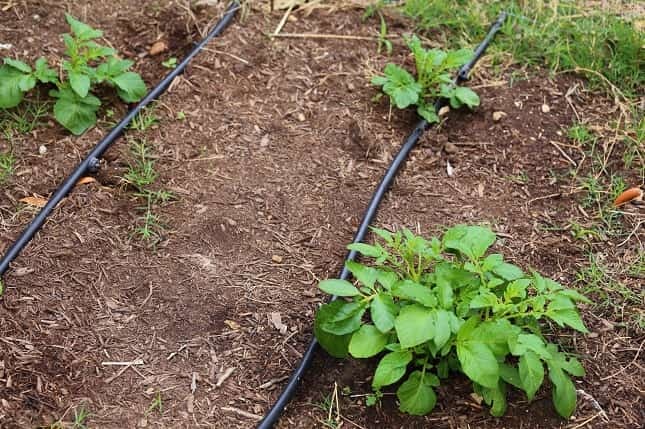 During this period it is imperative not to water your potatoes; because the vegetation is dead watering will only damage the potatoes underground. Cutting off the water is an important step for helping the potatoes harden off and begin to store their starches and minerals. Too much water can cause those spuds to rot or simply become too soft to be safely harvested. You can’t prevent much when it comes to rain, but often times simply avoiding any additional watering is enough. In the past I’ve waited until the first hard frost of the fall to start the final harvest countdown, but with our seasonal changes becoming increasingly erratic I’ve taken to breaking the stems of my potato plants near or on the estimated first frost date. The Farmer’s Almanac has a convenient guide to finding your expected first frost. Since they’re so delicate a gentle approach must be taken when harvesting your potatoes. It is wise to allow the soil to dry out as much as possible before harvesting to make the process easier and safer for the spuds. Many folks will recommend using a pitchfork to remove the potatoes but I’m not a fan of this method at all. 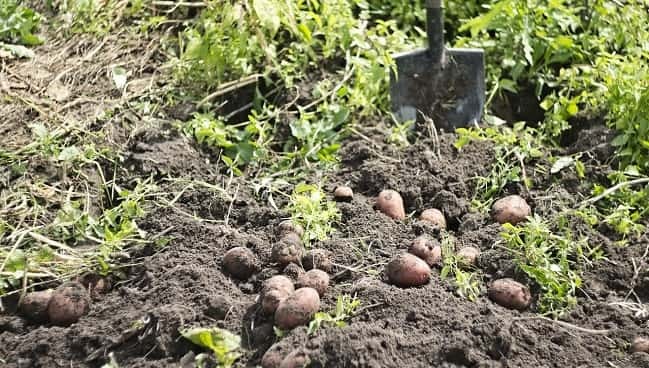 I prefer to use a regular shovel to dig those potatoes out of the ground; I’ll break up the soil about eighteen inches in a circle around the plant, then break it apart by hand to ensure the potatoes aren’t damaged during harvest. In a pinch I’ve used my soil knife (Amazon Link) to break up stubborn clumps of soil much more accurately than a pitchfork or shovel is capable of. The process is identical for harvesting eating potatoes instead of final crop potatoes, except that eating potatoes need to be eaten within a few days of harvest because they don’t last as long as final crop spuds do. Gently clean those spuds but remember how sensitive they are to bruising. A few quick wipes is all it takes to knock the worst of the soil off of the potatoes, but don’t worry about cleaning them too thoroughly. Potatoes are always best when they’re allowed to cure with a thin coating of soil around their skin. Place your potatoes in a cardboard box or burlap sack after they’ve been allowed to air dry. Keep somewhere with a moderate temperature (not freezing), preferably in an area with high humidity, for ten days. Avoid sunlight, and don’t let them freeze. Check crop again after they’ve been cured for any other spuds that have been damaged, then discard them. After the first ten-day curing process keep your crop in a dry environment to prevent them spoiling. If they begin to develop eyes, remove them. If you store your spuds in temps greater than 40 fahrenheit they will last about 3-4 months, but if you can maintain those potatoes in temperatures between 35 and 40 fahrenheit you’ll get 6-8 months out of them! In cooler temperatures and after they’ve been cured you can store potatoes in cardboard boxes or burlap bags. The goal is to allow some airflow and prevent the potatoes from sitting on a hard or impermeable surface for long. Ever leave a store-bought potato in a bowl for too long and wonder why it turns smooshy and gooey? Keep these veggies in a cool and dry location, away from any direct light sources. Remember that exposure to light can prompt the growing process to start anew, and we don’t want that. If you live in a warmer climate and cooler temperatures aren’t an option for you, you’ll need to get creative. One home gardener living in Arkansas suggests placing your spuds on a cool cement floor, one-layer deep, in plastic tubs, a method she’s been successful with. Ultimately the goal for storing any potato is to maintain it in a cool, dark, humid, and well-ventilated area. Potatoes store their longest when these conditions are optimal, and whenever these conditions are lacking the storage lifespan of spuds will be compromised. All we can do is to do our best with what we’ve got! I wouldn’t recommend storing potatoes in the refrigerator because of the lack of air circulation. When using any of these storage methods keep a watchful eye for rodents and other pests who are going to eat up what you’ve worked hard to procure. Pull your potatoes from storage a few days before use. This is to ensure they’re at their best taste and highest starch content. An option for potatoes you’ve freshly pulled from the ground, freezing your spuds is an option for long-term storage. It also saves the time required for curing. It’s about as simple as that, but let’s look at each step a bit more closely. Choose fresh potatoes right out of the garden, and wash them up well. 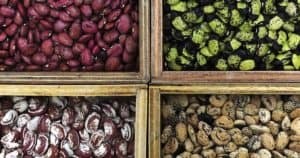 The lack of a curing period is contrary to other methods of storage, so if you don’t have the time or patience to allow your tubers to cure this is the method for you. You can peel the potatoes if you like, but it isn’t necessary. 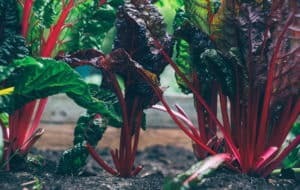 A vital step when it comes to freezing pretty much any vegetables, blanching prevents particular enzymes from impacting the flavor, texture, and familiar color of a vegetable. 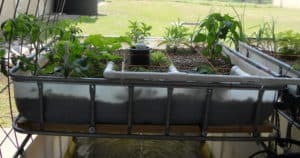 It also removes any remaining foreign material on the vegetable like soil or bacteria, and softens the veggies up making them better suited for storage. Too much blanching is as bad as too little blanching, which is worse than no blanching at all. Yikes! You might need to do some trial and error here until you get this step down just right. Now, when it comes to adding the potatoes to the water, you have a few options. A slotted spoon works to remove them from the water, or you can use a blanching basket for the work. I also suggest cutting up your potatoes beforehand into half-inch thick pieces. These will blanch more uniformly and are easier to store in a freezer. You can also keep track of exact weights more easily if you’re into that level of organization and prep. After the potatoes have been blanched for 3 to 5 minutes, they’re ready for cooling. Place the potatoes in a bowl of ice water for five to ten minutes, then drain the water (removing them with a spoon could damage the chunks you’ve cut, so err towards simply draining the water). Fill up whatever containers you’re using for the potatoes. Plastic containers work and so do ziplock bags. Leave about half-an-inch space of head room between the potatoes and the top of the container. Minimize any air in the containers for better quality down the road. Seal it up and freeze ‘em! Although they taste best if used within a year, you can freeze potatoes almost indefinitely. The colder the freezer the better it is for this storage method. 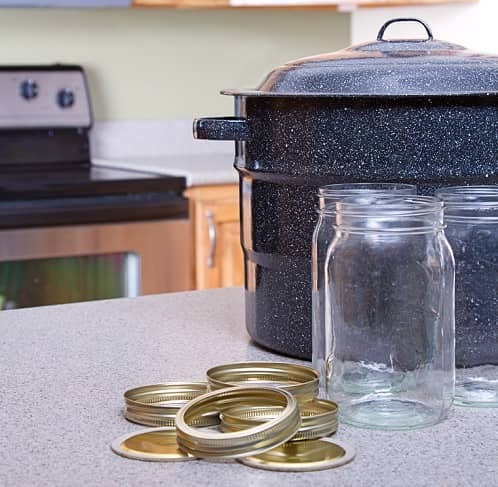 Besides knowing how to store your foods in jars (we’re going to be using the pressure can technique), you’re also going to need access to the tools and materials needed for canning. However, you get the longest storage possible with canned potatoes and preserve them in a great state. You’ll want to use either 1 liter or ½ liter jars for this process. Wash your potatoes and peel the skin off: Leaving the skin attached can cause problems because the bacteria that causes botulism is found in the soil potatoes are completely surrounded by during their growing process. Leaving the skin intact increases the risk of your stores developing botulism, so play it safe and remove the skins. Cut the spuds into chunks about an inch or two in size: If you’ve got small potatoes they can be canned whole, but only if they aren’t bigger than 2 inches in size. Cut them smaller and you could overcook your potatoes. Add to a bowl of cold water: Prevents discoloration when exposed to the air. Add to boiling water: You can boil whole potatoes for up to ten minutes, but a solid 2 minutes is all you need for the smaller chunks. Don’t overcook them, or you’ll have a smooshy bunch of spuds to work with. You can optionally add salt to preserve flavor, but it isn’t necessary. Add it to the bottom of the jar if you opt to include salt. Fill clean/sterilized jars with the potatoes and leave about an inch of room at the top. When pressure canning, you don’t need to sterilize the jars, the intense heat of pressure canning is enough to sterilize the jars by itself. However, the jars do need to be hot. Run them through a cycle on the dishwasher and leave inside the hot and steamy appliance until you’re ready to use them. Alternatively you can pop the jars into the pressure canner while the water is warming and kill two birds with one stone. Use fresh and clear boiled water (ie, not the stuff you boiled the potatoes in) to cover the potatoes and fill the jar, leaving the same one inch of room below the lid. Wipe the rims clean and clear of any chunks of potato or debris, remove the air bubbles, then finally place and seal the lids.The rims especially should be clean; keep the lids in hot water until ready to be placed on the jars. Once sealed and loaded into the pressure canner, you’ll have two options based on the size jar you used. Set the weighted gauge to 10 lbs/69kpa, and the dial gauge to 11 lbs/76kpa for each size jar. One-half liter jars should have a processing time of 35 minutes, and one-liter jars should have a processing time of 40 minutes. If you live at an altitude over 1,000 feet above sea level, you’ll need to adjust your pressures when canning. When stored in this method you can get between three and five years of shelf life on your potatoes. Not bad! If you save a few potatoes in long-term storage they can be used as next year’s crop. Keep a few covered completely in dirt, unwashed, in cool storage for up to seven months. About three to four weeks before planting season, place them in an area where they’ll get sunlight and are in a humid area. Once they start sprouting eyes they’re good to go in the ground. Large potatoes should be cut in half, but smaller ones (about 2 inches long) can be planted whole. Then you start the whole process over again!